Does a $5,000 bike improve an amateur cyclist’s performance? If you’ve ever spent much time around cyclists, you’ve certainly noticed they love to talk gear and if you’ve ever picked up a bike magazine, you’ve been inundated with ads extolling the virtues of bike performance. It’s nearly impossible to separate the marketing fluff from facts whenever doing research on a new bike purchase, given that most publications (both online and off) publishing reviews also take advertising from the companies behind the products. While researching a possible new high-end road bike purchase (I’m riding a 500 mile, week-long event at the end of the summer and thought shaving 3-4lbs off my bike would be nice), I came across the Competitive Cyclist website and I spotted something novel: they offer pro-level bike rentals/demos shipped directly to you for a week. I immediately recognized the brilliance of a demo program like this — while magazines and website reviews can all sound the same (“vertically compliant while laterally stiff“), the proof is in the pavement. A week of riding roads I’m familiar with would be a lot more informative than the common 10 minute test ride around a bike shop. I wanted to know what a $5,000 road bike with “crisp, tight handling” and also with “forgiving ride characteristics” felt like on the same roads I ride several hundred miles every year (which I typically do on a $1700 “recreational” aluminum frame/carbon fork Lemond). And more to the point: for an average recreational cyclist like me (60-80 miles ridden on a good week, in the 16-17mph avg speed range), does a $5,000 bike really improve your speed all that much? I decided to experiment with myself and pony up the $300 to rent a bike for one week (the $300 can be applied to a new purchase if I buy it in the next month). I specified the size I needed, put in my details and a week later, it showed up at my door. Assembly was very easy, just throwing the wheels on, airing up the tires, and putting the bars on the stem. A few adjustments and the addition of my own pedals and it was ready to ride. A quick jump on the bathroom scale holding my old bike showed it was 21.0 pounds with pedals (no water bottle or bag), while the Cervelo with my pedals attached was just 17.4 pounds for the 61cm bike (their largest frame). 3.6 pounds is a pretty significant weight savings for road bikes. The hyperbole around this specific Cervelo model is that it’s really stiff, really light, but also forgiving on the roads, with a more comfortable ride than similar carbon race bikes. From the moment I got on it, I could feel that it was much more responsive. On the same road loops I’ve been riding for the past few years, I was surprised by how the bike seemed to lurch forward whenever I put a little extra effort on hill climbs. I never thought of my regular bike as inefficient, but you push down on the R3 and it really goes. The handling was great as well — my typical ride features a couple high-speed tight turns that make me nervous on my regular bike but the Cervelo tracked them tighter and easier than I’ve ever done them before. The results appear to be pretty consistent with one outlying sample, but since this isn’t a real experiment and I couldn’t eliminate all possible variables I should say that the variability in improvement is largely due to how much rest I got between rides. On the shortest 5 mile ride, I did it a day after a long ride, and I usually take a day of rest (with rest, it’d be another 30 seconds faster). Wind and weather affected the 15 and 27 mile rides each time I went out on the demo bike, further slowing me down. The longest ride on the demo bike was my strongest ride to date — I slept an amazing 10 hours the night before and the winds were surprisingly calm. The previous 35 mile slower ride I’m comparing it to was the first time I did it alone and I rode it very conservatively. More importantly than the % improvement in my ride times, I did consistently ride faster, in the 17-18mph range on most rides, while the past few years of riding have always had me stuck in the 16-17mph average. My training goals have been to eventually work my way up to consistent rides in the 18-20mph average range. Moving up 0.5-1.5 mile an hour of average speed over an hour of riding on the demo bike was no small feat, taking me months of regular training in the past, and I’ve never been able to do a ride over an hour long in the 18mph range until that demo bike ride. The obvious question is whether or not going from a $1,500 average aluminum bike to a $5,000 handcrafted carbon bike is worth the added expense. For some people, shaving seconds off your time is a worthy goal while I would suspect most recreational athletes might want to see 10%-25% time/speed improvements on common workouts. I only found mild performance improvements on my own rides, on the order of single-digit percentage increases in speed and decreases in ride times. It’s definitely tough to justify spending 2-3x the amount of money without getting huge changes. My hope with this test was to prove to myself that magazines and websites and all the bike geek talk was for naught. As much as I love reading about all the latest gadgets in the cycling world, I’ve long been skeptical about their actual utility and I wanted some data to back it up. In this test I expected to see negligible gains, I expected a rough ride on a stiff frame, and I expected to conclude that $5,000 bikes are generally a waste of money for all but the top athletes. I wanted to free myself from the feeling that I had to constantly upgrade every year to the latest, lightest parts available. The one thing I can’t deny was the incredible feel of the Cervelo R3 when compared to any other bike I’ve ever ridden. After spending 25 years of my life on BMX and mountain bikes, the first time I took a spin on a road bike I fell in love with the feeling of raw power, blinding speed, and perfect efficiency. I bought my first road bike because it felt like there was nothing standing in between my legs pushing down in some effort and wheels spinning me forward at speeds I’d never attained on flat ground before. When I got up out of the saddle on my first climb with the R3, that same miraculous feeling again washed over me. Here was a new level of efficiency, a perfect melding of body and machine, with not an ounce of wasted effort going towards coasting down the road as fast as possible. The Cervelo R3 simply doesn’t hold you back, transmitting every ounce of your effort into progress on the road. In the end, I’ll admit the $5,000 bike won me over on feel more than performance, though the gains weren’t too shabby. I attained speeds I’ve never ridden at before and I suspect if I owned a similar bike that I’d continue to improve and attain levels I couldn’t do with my old bike. But more importantly everything about riding felt better on the high end machine. Shifting was instant and precise, climbing hills was faster and easier, and I had more control and could take tight turns at faster speeds. After my 18+mph two hour long ride was over, I felt like I could turn around and ride another 35 miles at that pace and I decided then and there that I’d bite the bullet and purchase a high-end road bike. 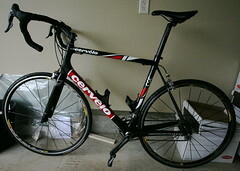 I eventually settled on a Cervelo RS, a slightly cheaper version of the R3 with a better fit for taller riders like me. At this moment, it’s on a UPS truck headed this way, showing up sometime next week. Previous Post Will MobileScrobbler work in the new iPhone SDK? Yeah, I’ve gotten pro bike fits from two different fitters before. I’ll definitely get one once I get the new bike, but the fit on the R3 was very good and I suspect the RS will fit even better. I second Rob’s suggestion of getting a professional fitting. Not only a bike fitting but a cleat fitting too. Generally, that’s a good reason to shop at your LBS – they often throw in a ‘free’ fitting when you purchase a bike at this price (at least, mine does). As always, excellent stuff. As a triathlete, I’m amazed how the right gear can make all the difference in the world. A professional bike fitting diagnosed a knee alignment issue and saved me a lot of pain. I highly recommend getting a professional fit. I look forward to hearing more about your training. this is why i don’t go on test rides!! i live in vancouver. i’ll say hi if i see a guy on a huge cervelo at one of the local rides. No doubt a carbon Cervelo 3.6 lbs lighter & better designed will ride better the old bike. Likely more aero framewise also. Without using the same wheels & tires, however, the speed difference is non compatible. I’ll be on my road bike quite a bit too this year hopefully. Bikes? Who needs bikes when you have extreme outdoor unicyclying here in oregon. We even got trails and parks set up for it. I have considered the Competitive Cyclist demo program a few times over the last couple of years. But I know if I do that there will be a few thousand less $$$’s in my account. I keep tooling away on my 4 year old Specialized Allez telling myself, “it’s not the bike”. I really like the Cervelo line and will probably get one eventually. Congrats on the new bike! Please give us a review once you have had it for a while. As you’re making decision whether to purchase a bike which costs more than a used car, consider how much motivation you will get from owning one. 8 years ago I forked over $4k on a Litespeed, and I never looked back. I started riding to work on most days which is 11 miles one way. The bike is still in great shape after about 10,000 miles. I haven’t replaced any components except for tires. I imagine that to get similar amount of motivation I would have to spent a lot more than what I did on personal trainers, gym memberships, etc. Maybe one day I’ll consider spending couple grand to get a new set of wheels, but for not I’m all set – Titanium is forever! I also test-rode a Cervelo — RS in this case. I was definitely faster on the Cervelo than on my old, but good race bike with Columbux SLX tubing, especially noticeable going uphill. However, I also found my heart pumping harder, while on my old steel bike, my legs seem to be the rate determining factor. Great story. I took the easier route. I am 53 and never really cycled other than a CCM I had as a 13 year old. I was a long time (25) years distance runner, but age and health issues made me a once-in-a-while jogger. Two weeks ago I decided to try biking. Did no research whatsoever, walked into a local pro bike store and walked out with a Cervelo Soloist Team. I knew about Cervelo as I read Triathlete Magazines. After a few rides and reading the Cervelo Forum, I walked in to the same bike shop and purchased the Cervelo RS and sold the Soloist a day later. A few rides on the RS later, I’m glad I did it. Of course, the Soloist was just fine for my level, but I guess its cheaper than buying a Bentley Sportscar for the mid-life crisis.